Today I’d like to tell you “the story behind the story” of the Little Boy in Blue. This book is based on an actual experience that I had with God and is therefore supernaturally based. The Little Boy in Blue is very interesting because many who know my history understand that the Little Boy in Blue is a story based on the life and death of my late brother, James Alfred. There are some important facts that you need to know, though. James grew to be a wonderful man. He was a husband to Janice and a father to James Dwayne and Sonia. He passed away when he was 33 years old. His latter years were a struggle due to quadriplegia as a result of an auto accident. Why then do I depict him as a “little boy in blue”? An explanation is in order. As I said in my previous blog, I was saved and filled with the Holy Ghost at Full Gospel Holy Temple Church, Dallas, Texas, in 1975. God started a hunger and longing in my heart that only He was able to fill following an automobile accident that James was involved in. James had become a quadriplegic in 1973 and our entire family was devastated. My search for the Lord was intensified because I realized that only God could help him. After I was saved, I began to pray for my brother. I asked God, in a childlike way, to allow him to walk again. I did realize that he had a greater need than walking again, though. He needed the Lord n his life. My sister, Cookie, and I were both saved and went to visit him and to give him the good news about Jesus Christ and the power that one receives when filled with the Holy Ghost. We were both brand new Saints, but we wanted our brother saved and filled with the Holy Ghost! We went to him and preached Jesus! He repented and although we had only been saved a few months, we were able to pray our brother through to the Holy Ghost! Another amazing thing happened about this time. My sister was given the gift of interpretation of tongues. While we were praying with James, I heard him speak in tongues. My sister kept asking, “When is he going to stop speaking English and start speaking in tongues?” My answer was, “What are you talking about? He’s speaking now.” While I heard his prayer language, she initially heard his English words. Suddenly she began to hear his prayer language. What she initially heard was a translation of his prayer language. God is so good. My sister, who is now both a Missionary and a prophetess, was given the gift of interpretation of tongues that same morning. My mother and my brother were able to visit me at Full Gospel Holy Temple Church in Dallas. This was very important to James because he wanted my pastor, the Late Apostle Lobias Murray to lay hands on him; God gave him the desire of his heart. After his visit to Dallas he was encouraged. He was able to return to College and get on with his life. His wonderful wife, Janice, was his caregiver and she was excellent in this role. We were all very much in prayer that James would walk again. About this time God had begun to visit me in dreams and visions. God spoke to me while in prayer one morning and let me know that “James will walk again”. I was so excited because I knew what I had heard. I knew that my brother would walk again. Unfortunately, James became ill as a result of his quadriplegia and passed away. We were devastated and I was confused and more than a little upset. I knew what I heard God speak to me. Needless to say, God explained it all in a most dramatic way. I won’t give away the bottom line because this is the basis of the book and I don’t want to spoil it for you. I wil say that in the dream I saw James; there is no doubt in my mind that it was him. The book is written for children because the message that it delivers is simple enough for a child to understand. I do ask that a loving adult or parent read the book to the children because it is not a “happy” book. It is very important that children are able to talk about death and dying because they have questions just as adults have questions. Many adults have told me that the book helped them because they had traumatic losses as children that no one would talk to them about. In this sense this is a healing book. I encourage you to read the reviews in Amazon.com about the book. So now, family and friends, I hope you understand a little better about why I took some “poetic license” with dates and time lines in the book. The James in my book was presented as a child because of the simplicity of the message. Please buy the book. It is very colorful and beautifully illustrated. It is available at Barnes and Nobles; at Amazon.com; and on my website: alfredevansbooks.com. You can also contact me directly. The book is now available as an audiobook and as an electronic book through Amazon.com in Spanish. My good friend, Graciela Salinas, RN at Texas Woman’s University and the VA, did an excellent job of translating it into the Spanish language. The only problem with the Kindle book is that it is in black and white, so the beautiful colors are missed. Call me, contact me through my website, or inbox me on Facebook. to get your copy. I hope you will give me feedback, either through Facebook, here on this blog or as a review. Many have said that it was helpful to them and that is my bottom line. I want to help others. One last word about James’ experience as a quadriplegic is that, as a result of his injury, I became a rehab nurse at the VA in Dallas in 1990. With the help of the Lord, I was able to do the foundational work for starting the Spinal Cord Injury Center there and worked in SCI for 20 yrs. The Center now has over 100 employees and is in the process of building a long term care facility for the spinal cord injured. I was able to retire from the VA in November, 2010. Isn’t God good? Love you all. And…I thank God that I am FREE. 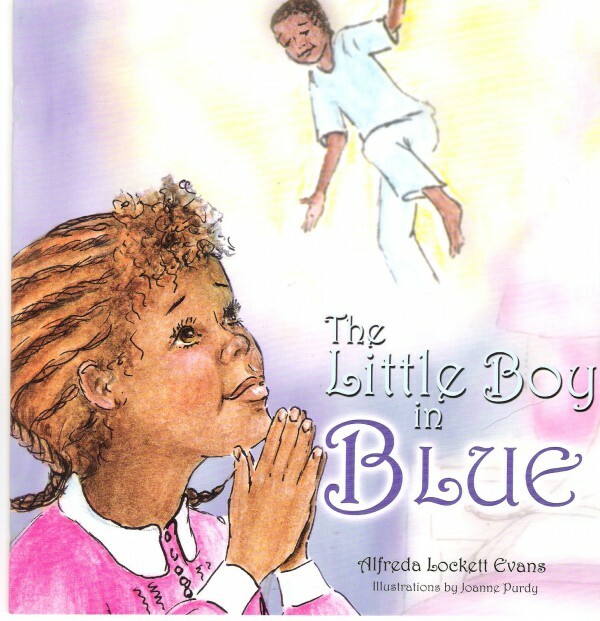 The Little Boy I Blue – Free Learns AboutLife After Death written by Alfreda Lockett Evans.